When a gorilla poacher told Rwandan conservationist and businessman Edwin Sabuhoro, “You’ve eaten, you’ve got a job that pays you and that’s why you are chasing us,” he stopped to think about it. He realised the poachers had no other source of income, and that tourists were prepared to pay US$500 just for permission to view one of the central African country’s rare mountain gorillas. So he invested about three million Rwandan Francs (about US$5,200) in a plan to turn the poachers into gamekeepers. And that’s why many former gorilla hunters are now ardent conservationists. Léonidas Barora is one of them. He sold elephant ivory and his family ate wild meat. Now, aged 64 and sitting in the Iby’Iwacu (literally: “Home-grown”) Cultural Centre, a tourist site set up on the edge of the park to provide alternatives to poaching, Barora says he would be the first to arrest poachers if he saw them. Iby’Iwacu got underway in 2007, when Sabuhoro recruited about 1,000 people from the forest perimeter into an anti-poaching association. He knew the community because a few years earlier – as a park worker for Rwanda’s Tourism and Wildlife Conservation Office – he had disguised himself as a businessman in order to act as a mediator between poachers and police. Sabuhoro helped develop farming activities and set up handicraft and other small-scale businesses to service the tourists who visit and stay to at the centre, which is owned by the villagers. Visitors pay more to spend more time with the villagers. They enjoy the do-it-yourself activities, such as helping dig up potatoes, fetching water, collecting firewood and cooking a meal. They can also do a “community walk”, visiting a local church and talking to local elders and leaders. There’s a replica of a royal palace, four traditional mud huts where visitors can sleep, cook and wash. A local healer is on hand to demonstrate medicinal herbs. Ex-poachers dance, drum and shoot arrows to showcase Rwanda’s traditional way of life – for a US$20 fee. Barora is one of the performers. About 100 tourists a month visit the centre, mostly from Australia, Britain and North America, and it’s clear from my interviews that a major attraction is the idea that the people who would once have been destroying the animals are helping conserve them. The income from the cultural activities goes to the village fund: 40 per cent is paid to the performers, 60 per cent is invested in health insurance, high-yielding seeds, education, and developing small-scale businesses. Sabuhoro’s travel agency, Rwanda Eco-Tours, advises the association’s managers and brings tourists to the village. Sabuhoro’s target is to help raise the village’s current monthly income of US$1,000 to US$100,000 by 2015. Iby’Iwacu and the 18 other ex-poacher associations involved in tourism in Rwanda have helped cut poaching by 60 per cent, according to tourism officials. More importantly, he observes, the Iby’Iwacu initiative is helping build a poaching-free generation of people living around the park and socialising with the tourists, “a generation that will not leave its children and the future generation to starve”. It has not fully achieved this aim: about five per cent of Iby’Iwacu members are believed to be still poaching. At Euros 225 million a year, tourism is Rwanda’s top foreign exchange earner – not bad for a country that 15 years ago was torn apart by the last major genocide of the 20th century. Drocella Nyirabureteri, a 47-year-old mother of three who spends about a half of her working hours at Iby’Iwacu, has a more human take on tourism revenues: “I get money to buy food when tourists buy my baskets,” she says – and she compares the death of an animal in the park to the death of a baby because, she points out, it is thanks to the forest animals that her community has a tarmac road, tapwater and classrooms. 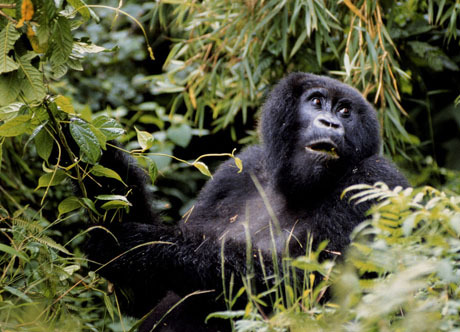 I had the pleasure of staying at the Iby’Iwacu village and visiting the gorillas in 2008. They are is still on my list as two of my life’s most memorable experiences. I have given numerous talks on my travels I know that my recommendations have resulted in a number of people also visiting. I am proud to have met Eugene Kwibuka, Edwin & Martha. If you get the opportunity you should go! I still treasure the warmth of our welcome.